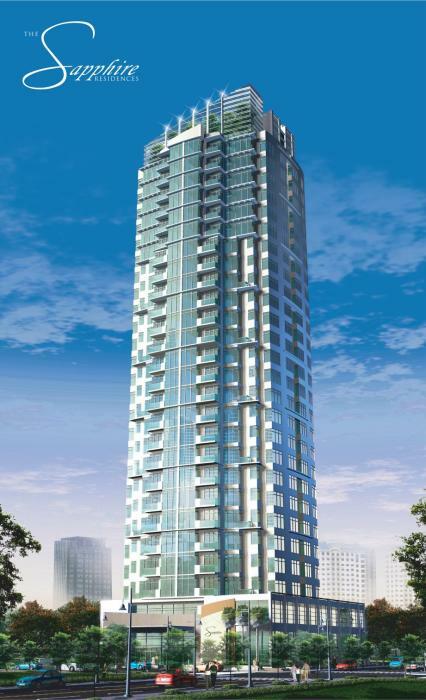 The Sapphire Residences is a 27-storey residential/commercial condominium development in Bonifacio Global City. The Sapphire Residences is situated in Crescent West, the best area in Bonifacio Global City; Sandwiched between Manila Golf and the 2.7 hectare Crescent Park. Prime location of the The Sapphire Residences is in the Crescent Park West of Bonifacio Global City, which is designed specifically for Residential Unit Purposes. The Sapphire Residences is located just meters away from the new St. Luke’s Medical Center, and right across the Gloria Jean’s Coffee Shop, Pancake House and the PS Bank Centre. The Sapphire Residences is literally steps away from retail and recreation establishments in Bonifacio Stopover commercial complex (Starbucks Coffee Shop, Jollibee, Chow King, 7-11 Convenience Store, BPI Family Bank, Bruno’s Barber’s Shop and many more!). The Sapphire Residences is a 27-storey residential/commercial condominium development with only eight (8) condo units per floor, the lowest in the entire Bonifacio Global City. Other condo units have more than 14 units/floor. This low density design ensures more privacy and exclusivity to unit owners. All units have corner views which contribute to a more spacious and brighter “feel” of the condo! The Sapphire Residences has a 40% footprint, leaving 60% of the area open for circulation, greenery, landscaping, therefore providing unit owners generous natural light and ventilation. – Two-storey high grand lobby. – Recreational area with swimming pool, sun deck and jacuzzi. – Shower and changing facilities. – Closed circuit TV (CCTV) monitoring for building security. – Emergency power provision for public areas and individual units. – Commercial spaces at the ground and 2nd floor. – 3 high speed elevators to service all basement, lobby and residential floors. – 2 communications connections for telephone and high-speed internet. – Pipe-in gas direct to the kitchen. – Potable water straight from tap supplied by Bonifacio Water Company. – Roofdeck with Sky Garden.